Welcome and thanks for stopping on my page. There’s a reason you’re here and I’ll bet it’s because you’re looking to transform your body and improve your health? Are you ready to get serious about getting into shape? Are you willing to make a commitment to yourself to regain your self-confidence and feel great when you look in the mirror? Are you prepared to change your eating habits to support a healthy metabolism? Are you excited to take your workouts to a completely different level? If so, then you’ve come to the right place. Southern California is one of the most body and image conscious places on earth. It seems like almost everyone is constantly searching for a great new diet or the best new workout. Walking around in workout clothes or athleisure wear is de rigueur. People look like they’ve walked off a movie screen or high-fashion magazine. The rest of us wonder how they manage to stay fit and toned. It’s no secret, though. Most athletes, celebrities, models and public personalities work out with personal trainers. And not just any personal trainers, high profile people are always seeking out the best trainers in the business. How do I know, because they keep me, and my team of High Performance Personal Trainers, constantly busy. But here’s my secret, we always have space for those of you who are committed to your health and well-being. We know you’re busy and your time is precious. Our trainers are available in West Hollywood, Hollywood, Hancock Park, Beverly Hills, Bel Air and other locations in West Los Angeles, Mid-City and the Hollywood Hills as well as in-home, on location and on-line personal training, yoga and conditioning. Our High Performance Personal Training team are all certified in personal training, nutrition, and/or yoga and go through additional private training to ensure they follow the core tenants of our body transformation and nutrition programs. Kevin is a certified personal trainer and and has over 20 years of experience helping clients achieve amazing body transformation results. Kevin’s dedication to his client’s success is unparalleled. He is a master of multiple fitness disciplines and enjoys challenging his clients with innovative workouts. You’ll always enjoy working out with Kevin and the results will speak for themselves. Kevin is available at our West Hollywood gym location as well as for in-home personal training in West Hollywood, Hollywood, Beverly Hills, Hancock Park and Park La Brea. Natasha (Tasha) is a certified personal trainer and yoga instructor. She has over 10 years of experience helping clients with rapid fat loss, rapid weight loss and post-pregnancy workouts. Tasha is available for in-home personal training in West Hollywood, Beverly Hills, Hollywood, Hancock Park and Holmby Hills, and at our West Hollywood gym location. Our programs are designed to get lasting, healthy results quickly. We also custom design programs for your specific goals such as post-pregnancy recovery, sports conditioning, fitness, physique and bikini, physique or bodybuilding competitions. Our trainers are experienced in a variety of disciplines and will help you achieve your desired results. Our only goal is to help you reach your goal, in fact, we’re eager to help you reach your objectives a.s.a.p., so don’t put off what you can do right now. There’s no time like the present to start your own personal transformation. Imagine where you’ll be eight weeks from now if you start your makeover tomorrow, then imagine where you’ll be if you don’t. Contact us today to start your body transformation. Sign up for our High Performance Personal Training newsletter, filled with transformation success stories, workouts, healthy recipes, tips, tricks and more. See why our clients are so happy with their results and get ready to be our next success story. You want to make sure you are making the most out of your workout time and that means hiring a skilled personal trainer like Kevin, Tasha or one of our other High Performance Personal Trainers. They will provide a smart and effective workout for you that changes as your body changes. You’ll get amazing results quickly and safely. Check out our client before and after photos for more examples. 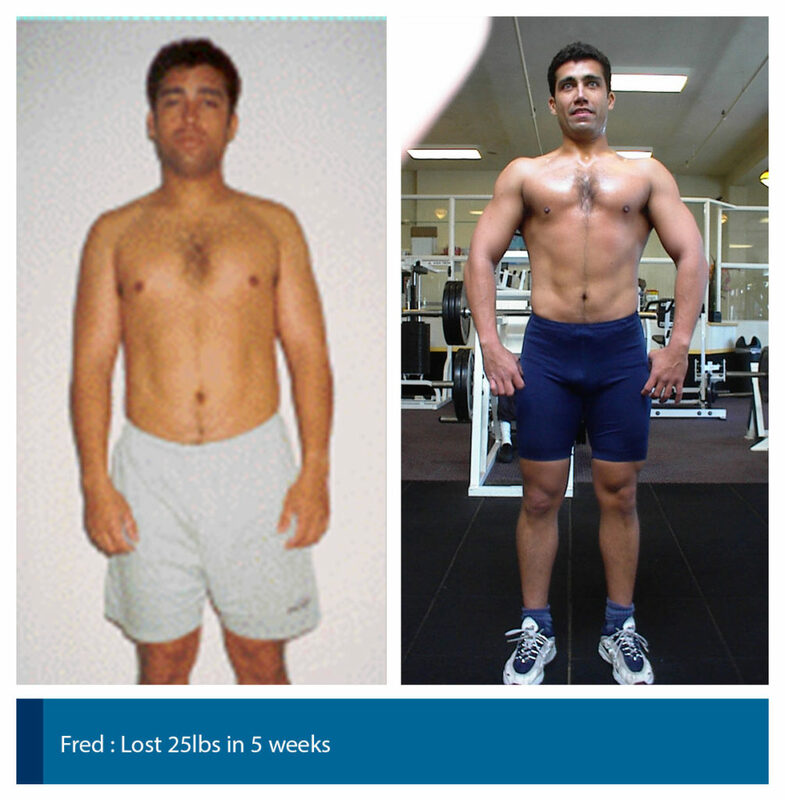 click here to see more client before and after transformations! Below is an example of one of an upper body exercise you can do at home. Exercise: Bench Press – With Bands. This exercise focuses primarily on the chest area but also works your shoulders and triceps. You will need to secure a band under your bench’s legs nearest to your head. Once you have secured it, grab both handles and lie down on the bench. While holding the handles, extend both arms in front at your shoulders width. Rotate your wrist outward, palm facing away from you. If you have a door anchor, you can affix it to the doorway and perform the exercise standing. Slowly bring down the band handles until your elbow forms a 90 degree angle. Then bring the handles up using your pectoral muscles. Keep a very slight bend in your elbows while in the extended position, squeeze your chest, hold for a second, and then lower it. Rinse and repeat. We have more routines that we would like to share to you. Give us a call or send an email today to set up an appointment with Personal Trainer West Hollywood Kevin so he can help you reach the well-sculpted body you envision. West Hollywood Personal Trainer Kevin Murphy is available for both in gym training as well as in home personal training in West Hollywood, West Hollywood Hills, Hollywood Hills, Trousdale Estates, Beverly Hills, Crescent, Oakwood, Parklabrea, Hancock Park and adjacent areas. If you live in LA and want the body to match, contact us today. Jason Kozma is a miracle worker waiting to get you the body you’ve been dreaming of. Train with him in Santa Monica or one of his West Hollywood personal trainers. Our team includes personal trainers with bodybuilding and physique competition experience for those looking to compete on the highest levels or just train and look like they do.